Have a Minor Sight of your own you'd like to talk about? 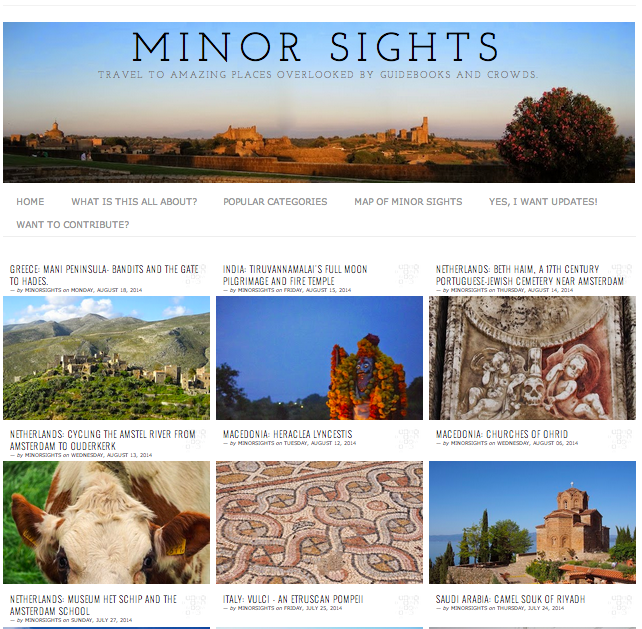 Minor Sights is a fast-growing website that covers places that are (barely) mentioned in guidebooks. But we can't do it all by ourselves- we thrive on contributions from others (like these.) After all, so many Sights, so little time... together we can create a more complete overview of Minor Sights around the world. Of course, guest contributors get full credit and name checks. So if you have come across some Minor Sights that you'd love to share with our readers, and you've got a knack for writing and photography, join in! A Minor Sight. What's a Minor Sight? As with most things in life, in travel, the 80/20 rule applies. Which means that the 20% of top sights attract 80% of people. A Minor Sight would be any of the sights that falls outside of the 20% of top sights in a certain place. When in doubt, our editor decides (such is his prerogative). Superfluously: the Eiffel Tower, Taj Mahal, and Epcot Center are NOT Minor Sights. Something interesting. This is even more subjective. Minor Sights focuses on art, history, culture, nature... pretty broad really. But something that's crassly commercial or artificial is probably not interesting enough. Good writing. You don't have to be a native speaker. But your prose most flow, and sustain interest. We're writing a travel site, not an encyclopedia. The best stories combine in-depth knowledge with passion and wit. What? Why Visit? Where? Getting there. Useful links. About the Author. All articles follow the same format. It helps readers to find their way. Great pictures. Without them, it's hard to make your story zing. Quality is important. Composition, colour, etc. A blurry snap taken in the half-dark is not good enough. Oh, no selfies. Your pictures. Those great pictures must be yours. (Or, if you didn't take them yourself, you own the rights). Practically all the pictures on the site were taken by the article's author. Only in exceptional cases can you use pictures available in the public domain. It's about the Sight. It's not about you. While we love stories told in first-person, our readers don't want to hear what you had for breakfast or why you miss your cat. Your personal experience and emotion in relation to the Sight will enliven the story. But the story needs to be centered around the Sight, not you. Of course you will get full author's credit, with your name, a link to your page, your website, and if you want your mugshot, your phone number (not recommended!) etc. 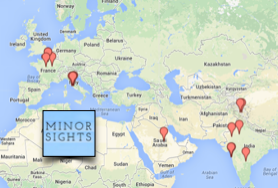 Get in touch with us through Editor AT MinorSights.com if you would like to contribute. Let us know what Minor Sight(s) you have in mind, and we'll take it from there. Thank Abishek. When you say 'we have some similar sights too' where/what do you mean? Hi I have been going through your site since last couple of days. I also follow your twitter handle for updates. It's very interesting to learn about new places, visit them and share with others. I appreciate your hardwork to bring forth the remote unseen and neglected places all over the world. India in one such home to wonderful natural places, unparalleled beauty, and amazing architectural wonders. Thank you for your kind words Baban. Glad you enjoy our work. Any sights that you have visited yourself among the ones listed here?